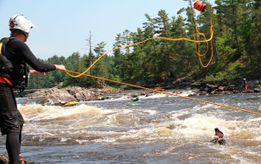 SWFR - Operations is a classroom, water practical, PowerPoint, instructor-led course that introduces students to both theoretical and practical knowledge of basic water rescue techniques. This course includes classroom instruction and practical field instruction exercises. 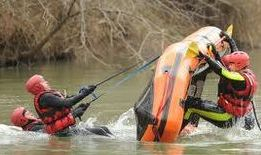 Training is focused in hazard recognition, equipment use, and basic shore and boat-base rescue techniques, along with a variety of other fundamental water rescue skills. This course is developed for personnel to support technician level water rescues in a higher risk of technical water skills. This is course is NOT a technical rescue level course but rather an understanding of basic shore-based rescue techniques. If you are needing a Swift Water Flood Rescue technical level certification, see our Swift Water Flood Rescue Technician course. AUDIENCE: This course is designed for individual who have attended and received certificate of completion of a Swift Water Rescue or Swift Water Flood Rescue - Awareness course and who are seeking additional knowledge and skills in order to meet certain job, regulatory, or other requirements. COURSE FORMAT: This is classroom and field practical-based which includes instructor, PowerPoint, skills interaction throughout the course. The course is approximately 12 hours in length. 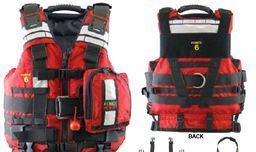 CERTIFICATIONS: Upon completion of this course, students receive a Swift Water Flood Rescue - Operations Course completion certificate and card that is valid for 2 years. If this is your highest current certification it is recommended to attend a refresher course every 2 years to remain current on new practices and technology.